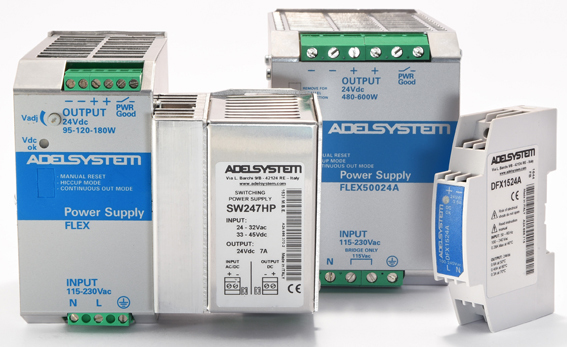 The Adel system offers a truly complete range of industrial power supply units for different applications. The wide range of input voltagesenables them to operate in any part of the world. The range isavailable with UL and CSA type-approved, with design based on experience gained over the years on more than 240 models. The FLEX units are designed to provide 1, 2 and 3-phase solutions. They are characterised by their remarkable flexibility of use that allows them to satisfy the most varied applications and requirements, according to the existing norms. They are DIN Rail mountable, simple and safe and offer IP20 protection. The FLEX range of products is characterised from 1, 2 and 3-phase input up to 700W with current rating ranging to 25A and a power flexibility that reach the 50% of the rated current In. The declared ambient temperature operations field start from 40 to 60°C. Three short-circuit over load protections, (Hiccup Mode, Fold Back and Restart after Main), the extremely small sizes of the units and the appliance to the EN 60204-1 Safety of Electrical Equipment Machines change the way to supply power to the control panel. Besides the 1-phase 115-230Vac units we offer the 2-phase 230-500Vac units, which allows to use and store only one product.